At the beginning of the 2018–19 school year, four students from West Milwaukee’s Cristo Rey Jesuit High School started assignments that have them working in our Waukesha, WI facility through mid-June 2019. Cristo Rey Jesuit follows a unique, nationally successful work-study model which enables each student to earn a portion of his/her educational costs by working in entry-level positions in Milwaukee area companies. Students are each assigned a day of the week to report to work rather than to school. Every fourth week each student works an additional Monday. Our Tuesday student is Leonardo “Leo”. Leo is a junior at Cristo Rey and joins SPX Transformer Solutions for the third consecutive school year. He looks forward to playing basketball and competing in track events this coming year. In addition to working for us and going to school, Leo also makes time to help at his family’s restaurant in Milwaukee. Leo can be found helping the HR team with a wide range of projects. Our Wednesday student is Daisy, a freshman student with the Cristo Rey program. Daisy is working in the Finance department, helping Accounts Payable (AP) with mailing, filing and processing AP invoices for payment. She has two brothers, one who is a senior at Cristo Rey and the other who is 6 years old. Her family has a dog and several birds. In addition to work and school, she looks forward to playing soccer this year at Cristo Rey. Our Thursday student is Thalia. Thalia is a sophomore at Cristo Rey and joins SPX Transformer Solutions for her first year in the work study program. She enjoys playing on a club soccer team, hopes to receive her driver’s permit this coming year and looks forward to pursuing a career in psychology one day. Thalia can be found in the HR office, learning the ropes and assisting the HR team as needed. Our Friday student is Daniela. Daniela is working in the Finance department, tackling the same types of projects as Daisy is on Wednesdays. She is a senior and comes to us with prior work experience in the Cristo Rey program as well as at Culvers and Minor’s Garden Center. Personally, her life can be summed up in twos: she has a twin sister as well as two more sisters, two brothers and two dogs! In her free time, she participates in volleyball, basketball and track. Cristo Rey Jesuit High School in Milwaukee opened its doors to its first class in July 2015 and is part of a nationwide network of 35 Catholic, college preparatory high schools for students from limited financial means. All Cristo Rey schools share a unique and innovative model which empowers students to pursue higher education through a rigorous curriculum and provides invaluable professional work experience through the Corporate Work Study Program which helps students make informed decisions about their abilities and their future. Exploratory teams reached out to SPX Transformer Solutions in 2013 while evaluating Milwaukee as a potential site for a Cristo Rey school, inquiring if we would support a work study program for high school students. When the school held its inaugural freshman class orientation in 2015, officials were still gaining support from suburban companies so most students were placed with employers in downtown Milwaukee. When we were approached for the 2016–17 school year, the company jumped at the chance to participate. SPX Transformer Solutions has now been the beneficiary of the student workers’ productivity and contributions for the last three school years, and, in turn, we provide job coaching and mentoring that allows us all to play a part in developing the talent pool for Milwaukee’s future. To learn more about Cristo Rey, visit www.cristoreymilwaukee.org. 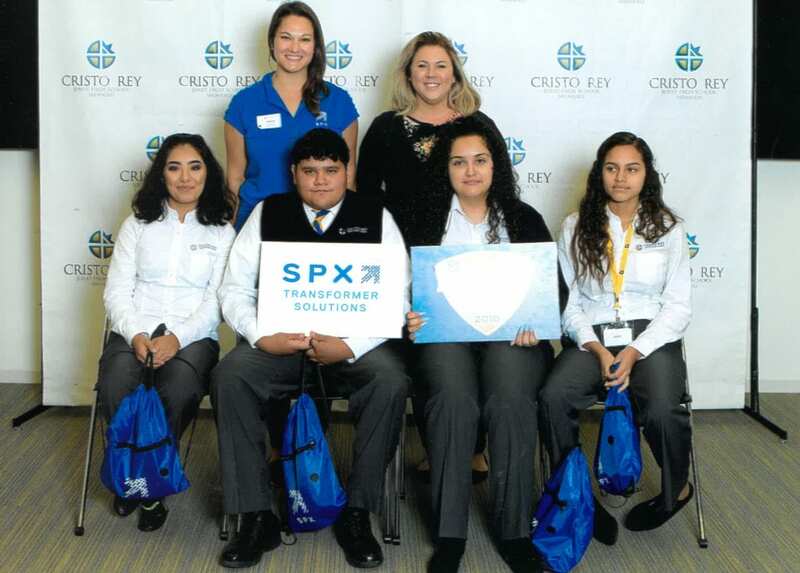 SPX Transformer Solutions is proud to be a job partner with Cristo Rey Jesuit High School, helping guide them on their path toward a successful future!